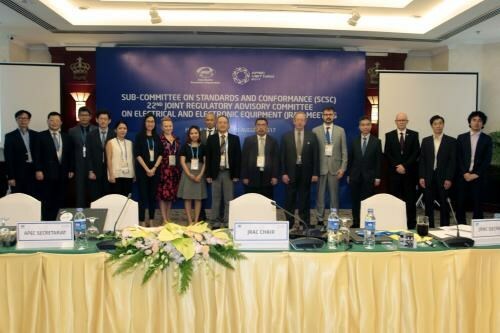 HCM City (VNA) – The APEC Sub-Committee on Standards and Conformance (SCSC)’s Joint Regulatory Advisory Committee (JRAC) on Electrical and Electronic Equipment convened its 22nd meeting in Ho Chi Minh City on August 20. The event, as part of the third APEC Senior Officials’ Meeting and related meetings, attracted delegates from Australia, New Zealand, Russia, Chile, Japan, Malaysia, Indonesia, Thailand and Vietnam. It focused discussions on regional electrical and electronic equipment management such as refining mechanisms and policies with a view to facilitating trade and investment. Participants also considered JRAC’s priorities this year including implementing the Pathfinder Initiatives and the APEC Electrical and Electronic Equipment Mutual Recognition Agreement (EEMRA), working to deal with risks arising from electrical and electronic products, and amending JRAC’s working regulations to improve its operational efficiency.